I will have a booth in the Grand Bazaar NYC on the upper west side every Sunday of April! I am at the Grand Bazaar all day with the Edie Art booth! I will have a pop-up store with many wonderful new creations in the beloved Chelsea Market for two weeks in March. Our brand new mindfulness children’s book series “Stories for Being” will be available here first! I will be at the Artists & Fleas in Brooklyn with my booth Saturdays and Sundays 10am-7pm in December. We are in full prep for the Holiday market at Union Square. Come visit this season any time Nov 17th-Dec 24th, I will be happy as always to see you there and show and offer all my new work and catch up!! I made a series of 12 paintings last year  in Holland that I see as a self-portrait. Each painting represents another aspect of 'me' and each of those slices of myself is accompanied in the painting by an animal suited to the color/mood/ meaning of the character. I made these paintings into a tiny film, an animation earlier this year. The idea and meaning behind the film are that all these so-called ordinary daily activities we repeat all the time, carry within them a very extraordinary and magical reality. If you care to see it of course. I also created a soundtrack for it, which is a spoken word piece with a bit of music. So excited to be showing in my second film festival ever- it's a US premiere!! Get your tix for the showing of my short animation 'Day' and come enjoy the Chain Film Festival in Williamsburg with me and many others! The showing of my short is on August 9th, 4pm. My animation short "Day" has been selected in the Female Eye Film Festival in Toronto!! I will be attending the showing on Thursday June 22nd to see my own tiny film on the big screen and to give a Q&A afterwards. BUC, The Great Hall. Free Screening. From 10 am-6 pm [unless rain] the Edie art stand will be set up on Prince between Mulberry and Mott together with many other wonderful artists and artisans. Come see and don't hesitate to contact me for any special orders bringing in. Prince Street between Mulberry and Mott. One of NYC's biggest streetcars [Brooklyn's biggest for sure I'd say] it's a fun, buzzing, great fair to go and find something special or just to enjoy the street fair vibe. This Saturday, sept 17, from 11-5, come see me in Hell's Kitchen, on 9th Ave between 48th and 49th. 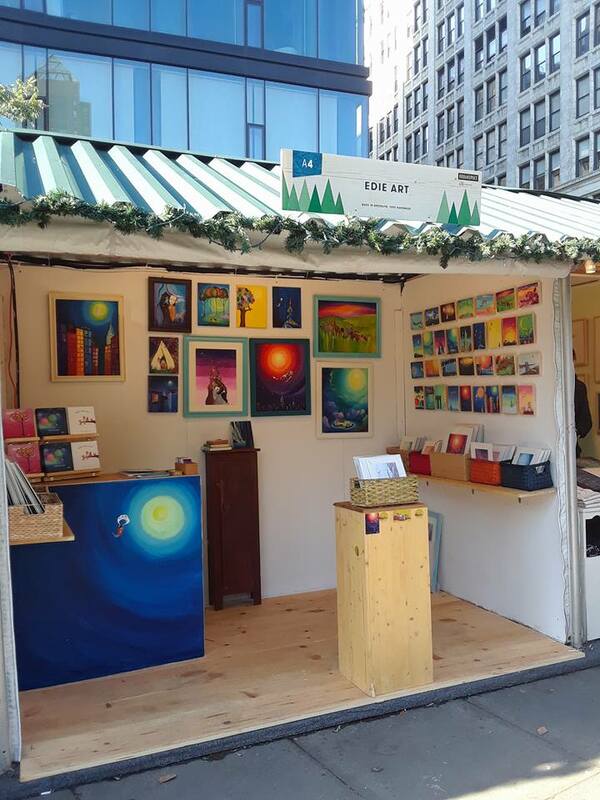 Union Square Holiday Market 2015!! The #UnionSqHolidayMarket is OPEN again! My booth is located in a DIFFERENT spot this year, **A5**, it is on the West side of the square, close to the farmer's market. We are open every day until Dec 24. Come see us and all the new work and colors!!! We will be open daily from Monday August 10- Sunday August 16 from 11 am til 7:30 pm. Located in the large open space opposite Amy's Bread. The Edie Art stand will be set up every Saturday and Sunday throughout August. Prints, woodblock prints and originals available! !